Close-up/strolling Magic is one of the most intimate forms of Magic and Derek does a fantastic job of creating miracles in the hands of spectators he just met! This is ideal for the cocktail hour for an event or even great as an icebreaker to get people interacting and mingling with each other. Derek is one of Southern California's top sleight of hand magicians, and you can see this in action as he uses items such as cards, coins, and even borrowed bills, and rings to make the Magic happen with the spectators own objects in their hands. As an Award Winning Close-up Magician, Derek knows how to create such memorable miracles that will be talk of the event years to come! Let Derek showcase his charming personality, wit, and humor for all of your guests at once! Derek can entertain a variety of audiences from your most intimate group to a theater of several hundred people. Derek's stage/stand-up act, incorporates audience participation where the guest get to join Derek up on stage to become the stars of their peers! Allow Derek to get in the mind of spectators where he reads minds, makes predictions, and knows things he should NEVER know! He provides for mix of fun, visual, creative, and mind blowing effects that will astonish even the most skeptic viewer. And Derek can cater his show to any size audience, venue, and or company theme. 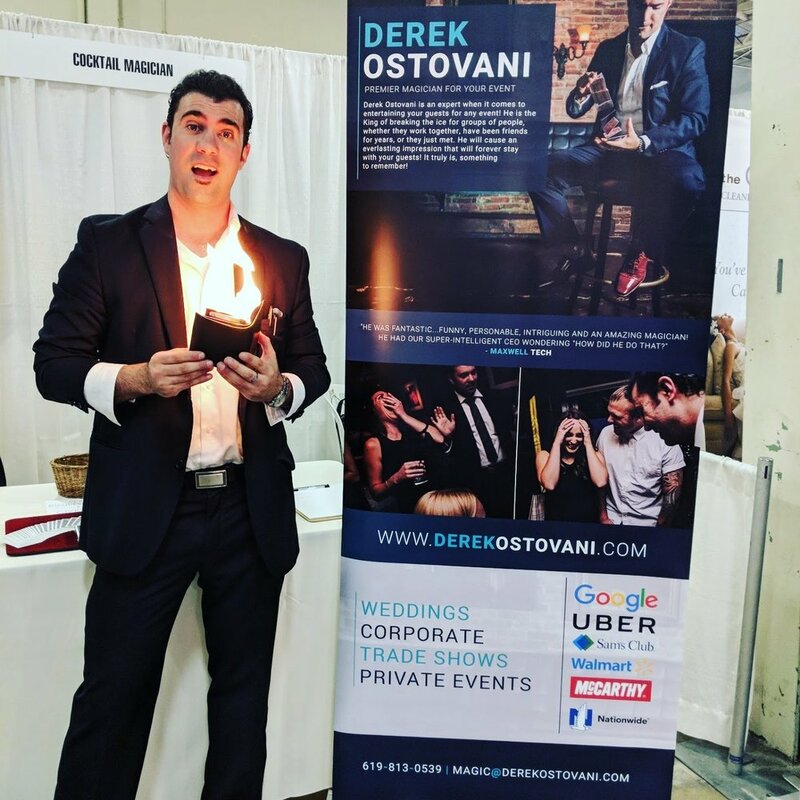 Trade show Magician Derek Ostovani is no stranger to Trade Shows! In fact, magicians are the BEST way to not only attract a client, but a magician is the best way to get across a message for your company.Whether you want a specific message you would like Derek to convey, or you want to consult with him to come up with the best message and the best way to convey it, Derek will use his creative thoughts and ingenuity to create the strongest message for his clients! A MEMORY TO REMEMBER FOREVER! California's premiere Wedding Magician, Derek Ostovani is an expert when it comes to Weddings! Leave it to him and he will entertain your guests while you're busy taking pictures or tending to other important events. He is the King of breaking the ice for groups of people, whether they have been friends for years, or they just met. He will cause an everlasting impression that will stay with your guests! It truly is, something to remember. People will think he is your BEST MAN! Then after cocktail hour, when the wedding is all about the bride and groom, like it should be, he disappears! Why book Derek for your Wedding? There is so much down time during Wedding photos, and people don't know each other, and their getting hungry and antsy. This is the time I come in, and WOW the guests, break the ice, and create memories that will stand out from any other wedding! Your wedding day is the most memorable day of your life. I will compliment your day with sophisticated entertainment of the highest level.